When you first walk into The Quarterdeck you are under whelmed by the apparent size of it. It seems cramped by the front door, and there are several small tables set along the wall on one side with the bar on the other. But don’t let that first quick impression stop you. Ask for a table in one of the other areas "in the back" and you will be very pleased. The tables are not crowded together, and the overall ambience is cozy and friendly. The beautiful old wood that was used to build the interior we later found out was from a real 17th century sailing ship. The rustic beams and the various artifacts on the walls add a wonderful Cape Cod charm to the setting. 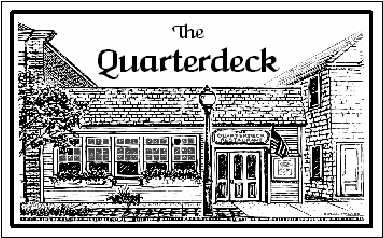 I have visited The Quarterdeck on many occasions and the food has always been excellent. My companions each time agreed that the quality, presentation and taste were wonderful. Our favorite dish was the baked stuffed lobster. The delicious stuffing was moist, meaty and seasoned just right so as not to take away from any of the sweet lobster taste. We have had this on 2 occasions and both times it was perfect. I would highly recommend that you call ahead as on one occasion they were out of lobster by 8:30 on a Friday. We called ahead and informally “reserved” 2 lobsters the next night so as not to be disappointed. Other entrees my parties tried were New York strip steak, Salmon, and scallops. The steak was cooked exactly as requested, and the accompanying salad and baked potato were fresh and perfectly prepared. The salmon was firm, but not dry, even if a little heavy on the glaze. The scallops were large and had a nice, sweet taste. The traditional New England clam chowder was to die for, and the calamari was tender with just the right amount of breading. The service has been very good on all except one occasion when our server was overly distracted by some apparent friends that he was also serving. On all of the other visits we were unhurried and relaxed. Each course arrived at just the right time, and refills and extra requests were handled quickly and pleasantly. Our bills for 2 (before tip) were around $85 when we both ordered lobster, an alcoholic beverage and shared an appetizer. On other occasions our bill for 2 was around $60. Our overall impression of The Quarterdeck was one of relaxed satisfaction. The next time we are on the Cape, we will definitely head here.